From all those that hunt woodcock, woods or mountain grouse, huns, chukar, mearns or scale quail, or pheasants there is universal agreement that Missouri Quail Hunting is the hardest to hit upland bird. Wild Bobwhite Quail are ground and brush loving birds that seek to return to that cover whenever flushed to fly. They rarely fly level or straight. Most will agree the common target acquisition and engagement is at two seconds. Combine the speed and erratic flight of a quail with walking fatigue and the average hunter on his better days may have a 50% hit rate. The worst action we could take would be to display all hunting pictures with daily limits. The implied would be that all hunters, every Missouri hunting day would bag a limit. The reality is there are some hunters that have the dog power to get more limits than others. Most hunters have less than limit days. All will agree the potential in covey numbers exist for great hunting. It is the nature of Missouri’s wild quail that they are hard to put in a bag. Season opens the first of November runs through January 15. Hunting is seven days a week. No shooting hours other than first to last light. Residents and nonresidents have the same seasons. 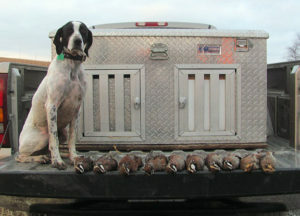 Eight quail daily bag limit. 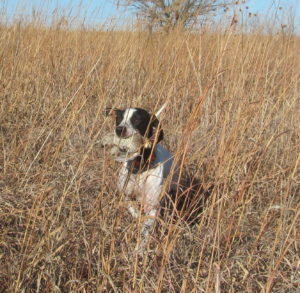 Dogs on quail retrieve show the micro Missouri hunting cover. 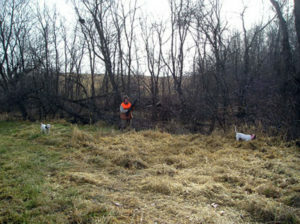 Natural hunting habitat is our description at how the Association does not develop specific cover for Bobwhite hunting. Natural means the outcome from grain farming in river bottoms that creates much crop land to wildlife cover edge hunting habitat. We do not hunt all ground as coveys do not occupy all ground. 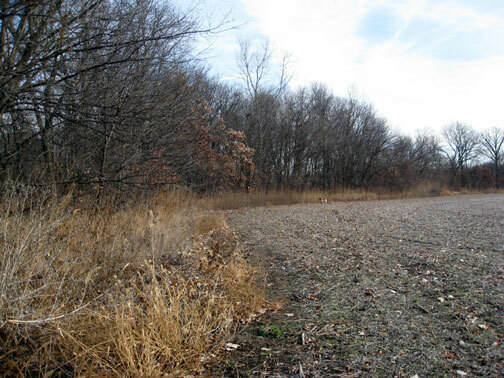 When it comes time to lease land we simply spend Association hunter dollars to lease private land that has this combination of feed and protective cover. 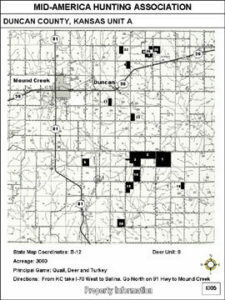 And it is only private land within a region that has a history of Bobwhite covey survival. A wooded drainage with a boarder of short grass or weeds cutting through a row crop field. This is a late December picture. The green grass is laid down fescue. The brown grass is foxtail. The trees may be thinner or thicker and immaterial as it is the low to ground cover along the tree line and the grain field that is the critical quail habitat for the better wild Bobwhite hunting. Crop field edge cover is a seemingly small point we found required of repetition. All the more so for those traveling in from non-native wild quail population states. That may not be appreciated at this point to for those considering their first hunt out our way. It is a common comment from those completing their first hunt and our motivation for this extensive wild quail cover section of the web site. Putting all these Missouri wild quail habitat pictures together will help calibrate the eye for where to hunt. As a self guided quail hunter organization knowing what habitat to hunt and that which to ignore will make for a better hunt. Missouri cover habitat may seem limited and it is in many spots. On other farms it runs for more miles of linear crop edge than most hunters have the energy to cover. That is one more value of our self guided hunts. Most hunt hard for a day or two then take a slow day of sleeping in without an alarm, breakfast and then heading out. Quitting early is another option. This more relaxed attitude towards the hunt takes a few years to develop and comes more from the understanding there is more land to hunt than time. And, the coveys are there. The angst about finding a spot to hunt or that of beating the next guy soon disappears. Upland bird hunters must remember they are on private land. That translates to when crops are standing the edges may be hunted, but do not cut through the fields. On a typical season crops are cut. Any cut stubble field may be hunted. Soybeans typically are harvested before corn. Corn is more likely to be standing come opening weekend. Land to avoid for Bobwhite coveys, a fallow pasture with no crop on it, below. The place to hunt such a farm is along any of its edges boarding a crop field. A likely turkey spot as well. Dogs not broke of turkey may find these long running birds a strong temptation when found in 50+ flocks. 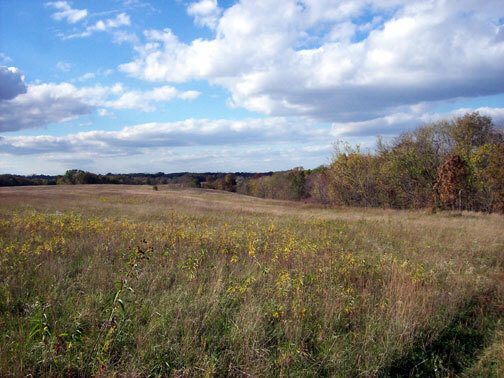 Fallow land is often a sign of other than farming corporate land, equity or investment group land. Using our online road maps will get the hunter to this sign. The yellow sign is one of ours that gives confidence to the Association hunter he has found the right lease. It will be the online road maps with road names that will get the hunters to the right land. 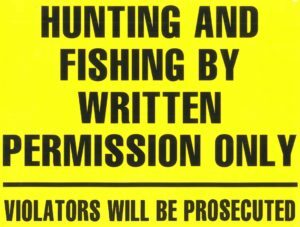 Regardless of how good our maps may be or our sign postage each new to the Association hunter will feel a bit of hesitation in his gut when stepping on to what he knows to be private land. That hesitation comes from that hunter not personally having met with the landowner before hunting that land. That feeling will soon fade with reassurance of the road names posted at most road intersections that will match that of the Association issued map sheets. The corner post signs serve as further reassurance to hunter he has authority to be on that land. Another aspect that hunters should remember to help overcome any hesitation is the collective buying power of the Association gets us large acreage corporate farm land. It is possible that any farmer encountered while hunting is an employee or tenant farmer as the actual landowner of the Association hunting land. It is a case that looks may be deceiving. Just because someone is encountered that is dressed like a farmer does not mean he is the landowner of that spot. Ice fog is far more likely to be encountered during winter than is snow. It is more miserable. While frozen it is just an annoyance. Once the sun comes up and the ice starts to melt it is soaking through to the skin hunting. Fortunately due to common low humidity winter conditions by noon the land is dry again.